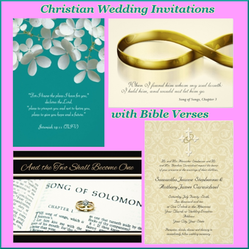 There is a beautiful array of Christian wedding invitations online, which feature scriptural verses as part of their design. I've collected them together here. Some of the world's most poignant, powerful and inspirational words are found within the pages of the Bible. Therefore, it's little wonder that many creators of Christian marriage invitations include verses of scripture within their designs. As a Christian couple getting married, your intentions regarding this union could be encapsulated in the Bible verse chosen for your invitations. Your guests not only get to delight in the knowledge that wedding rites are forthcoming, but will receive beautiful words to contemplate too. What a fabulous missive to receive! Check out this collection of Bible inspired wedding invitations for Christian marriages, each and every one of them featuring scripture within their artwork. Verses are always lovely on letters and cards. Scriptural verses on Christian wedding invitations are even better. Quoting verses from the Bible on wedding invitations is one way of demonstrating that a Christian couple are paying attention, and that they know where to go for advice about their marriage. The good book has a great deal to say on the matter. People have been getting married for a very long time, before even Christianity had a ceremony to embrace their union. Those mentioned in the Bible, or writing its passages, have been known to attend weddings of their own, or else comment upon the human condition wherever two are united as one (Ephesians 5:13). That provides plenty of scope, not only for guidance during a marriage, but as something wonderful to quote upon your Christian Scripture wedding invitations. What better Biblical verses for Christian wedding invitations than the scripture which forms the basis of most Christian marriage rites? We have two different takes on the matter, but St Mark and St Matthew are both reporting upon the same scene. Here Jesus Christ's own words are quoted, as He describes marriage during His mission in Judea. It's an interesting passage - with some hidden depths beyond the overt message - and a perfect addition to any invitation to attend a Christian wedding. Meanwhile below, the scripture based Christian wedding invitations quote the Bible from yet a third telling of the same exchange. The second invitation for Christian marriages depicts the Bible open at the Song of Solomon, a beautiful bit of scripture in its own right. However, I've included it here, as the legend at the top is from the aforementioned Ephesians verse. Mind you, the Song of Solomon has proven to be an inspiration for Bible verses on Christian marriage invitations too. As those below deftly demonstrate. It was but a little that I passed from them, but I found him whom my soul loveth: I held him, and would not let him go, until I had brought him into my mother's house, and into the chamber of her that conceived me. The muse was certainly with Solomon at his lyre. Those are beautiful words in whichever translation of the Bible you care to name. Incidentally, most of these are customizable Christian wedding invitations. Therefore if you love the verse, but it doesn't match the one in your own Bible, you may click the 'customize this' button and alter the wording to that which is much more familiar. I do understand this one. I grew up reading the King James Bible. I've already had more than a few double takes over other versions today! Some designers actually do include an indication as to which version of the Bible is being consulted. One of Zazzle's most popular scripture wedding invitations for Christians may be viewed to the right. It clearly states that the Christian marriage invitation's Bible verse was lifted from the New International Version. Though extremely popular (currently on the front page), this Biblical wedding invitation is also rather rare in that it quotes Jeremiah. I don't think I've come across another drawing upon any of those verses in my hunt for quality Christian invitations for a marriage online. It's very apt though, taking as its inspiration words that the prophet Jeremiah wrote in a letter to his brethren in Babylon. There he encouraged them to settle down, marry and have children. They had another seventy years to wait before the Good Lord would be willing to let them come home. They might as well truly live their lives during the interim. Jeremiah - as a source of scriptural verses for Christian wedding invitations - may be an uncommon choice. However, holding prime place at the other end of the spectrum is the one that I've saved for last. The most popular scripture verse to add to a Christian invitation is *drum roll* 1 Corinthians 13: 3-8! Love is patient... and also everywhere on marriage invitations for Christian couples. I've selected just the top six. There are MANY more to choose between, if none here are to your liking. There are whole reasons why St Paul's words to the Corinthians are so widely quoted as Biblical verses on invitations to a Christian marriage ceremony. They are beautiful lines, in the wording and the sentiment too. They are very appropriate for Christian couples on their wedding day. Let's remind ourselves of the context for 1 Corinthians 13. This powerful chapter is much more than that quoted above - and on hundreds of Christian wedding invites - containing some of the most famous lines in the whole Bible. If you haven't read it recently, I thoroughly recommend refreshing your memory. Most marriage invitations for Christian weddings use the New International Version Bible wording, but I prefer the translation from my childhood, the King James Bible. But click on that and the pull down menu at the top will switch it to whichever Biblical rendering you favor. If you have a marriage built upon love, then you already have Jesus Christ right there in its center. Not a bad start at all. No-one ever described Christianity better than St Paul. Hence that love being the most popular Biblical verses for Christian wedding invitations. What's the Difference Between a Christian Wedding and a Normal Church Wedding? Most Western marriages begin at a church altar. So why do some couples differentiate between those rites and a Christian wedding? I found out. Forget white! As Christendom's traditional wedding dress color, blue wins outright. Come and explore your choices in blue wedding dresses. Christian wedding card messages would be a lovely touch for a couple embarking upon a Jesus centered marriage. Check out what Christian wedding cards are available. Christian wedding presents are those which highlight the love of Jesus Christ in any marriage. There are plenty of Christ-centered wedding gifts from which to choose. Frank - Nor mine. But then again, I was raised CoE, so there's little of the Mysteries left standing. Just a lot of 'thou shalt nots', of which 'thou shalt not read Song of Songs' was never one of them. I'm glad that you liked my article. I know that weddings aren't exactly your thing (give or take your own! ), so that makes it even lovelier that you stopped by. Malachi has always rather startled me, simply because his name is so Welsh. Though I'm assuming now that every Welsh Malachi I've ever met had their name from the Bible. Thank you for clarifying the scripture here. Ember - I just stopped halfway through reading your comment, so that I could read the Song of Songs. Wow! Your version is much more risque than ours: https://www.biblegateway.com/passage/... Not really, I suppose, it's just that your version says it in ways that no average fifteen year old would miss. I'd have been McKenna here. I do hate censorship. Corinthians is quite a classic here. Not just for weddings, but everything. It was read by Prime Minister Tony Blair at Princess Diana's funeral. Wow Ember. I make a point of learning about religion and until now I had never heard of anyone giving the instruction to only read Song of Songs on one's wedding night. That sounds like prudery on a massive scale. That Kenna heard the same instruction elsewhere alerts me to the fact that this is not a one off act of a fanatical idiot, but is an established practice in some churches, not mine, I assure you. However to the point. This was an excellent article that demonstrates religious knowledge broader than one's own religious allegiance. That's always a good thing. One small issue. The Pharisees were raising a contentious issue with Jesus to ascertain his views. Judaism was split on divorce between the traditionalists, who thought that you needed good reason to divorce your wife, and the "liberals", who thought that a man could divorce her for any reason, however trivial. On asking Jesus' opinion they found that he was referring to the prophet Malachi, through whom God speaks to say " I hate divorce. " [Malachi:2:16] For Jesus, if God hates something, don't do it. Malachi was the last Old Testament prophet, and so the implication is that as the revelation developed God's will was becoming clearer: nothing cruel or loveless. Ah, you've got one here with verses from Song of Solomon. When I was younger in church I was told I was absolutely not to read that until my wedding night, and only then I would read it WITH my husband. Then I was put in purity classes where I made promises to keep myself pure for my future husband. I listened, I had my reasons. And this is my favorite thing, because Kenna was essentially told all the exact same things at her Church as a child around the same age, and her reaction was to immediately read it. The Corinthians verses are really classic for Christian weddings, but you know, I think it is with good reason that it is a classic.